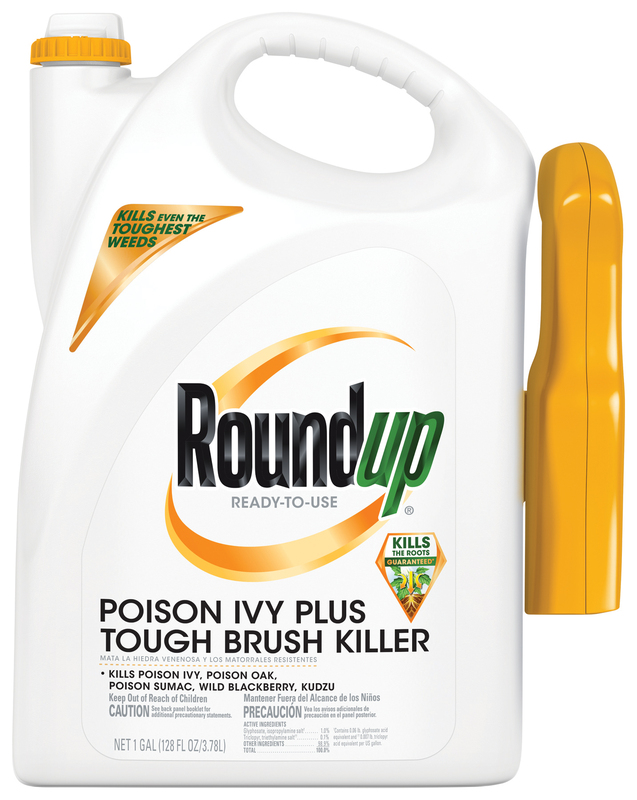 Roundup® Ready-To-Use Poison Ivy Plus Tough Brush Killer combines the power of two tough brush killing ingredients to kill even the toughest weeds and grasses! It also kills ivies and weeds like poison ivy, poison oak and poison sumac, as well as invasive vines and shrubs like kudzu and wild blackberry. Kills many types of tough weeds: poison ivy, poison oak, poison sumac, blackberries, kudzu, and other tough-to-control brush. Rainproof protection in as fast as 30 minutes. Use on wooded lots and other areas where brush invades your yard. Can be used to kill stumps and prevent regrowth. One gallon covers approximately 300 sq. ft. 24 oz covers 56 sq. ft.
Use on wooded lots and other areas where tough weeds are invading your yard. For more information on what products to use and where, click here. Spray the weeds or brush you want to kill until thoroughly wet. If vines are growing up poles, fences or tree trunks with mature bark cut vines to a height of 3 to 4 feet and spray vines thoroughly. If vines are climbing shrubs, or tree trunks with green bark, cut vines at base and spray regrowth. Do not use in or around edible food or feed crops. Do not use for lawn renovation or flower bed and vegetable garden preparation (plot preparation); instead use Roundup® Weed & Grass Killer Super Concentrate. Apply when weeds are actively growing. For best results, apply during warm, sunny weather (above 60°). Spray when air is calm to prevent product from drifting onto desirable plants. Rain or watering within 30 minutes of application will NOT wash away effectiveness. Controls tough brush and hard-to-control weeds such as poison ivy, poison oak, poison sumac, blackberries, and kudzu. Caution: Causes moderate eye irritation. Avoid contact with eyes, skin or clothing during and after application. Wash thoroughly with soap and water after handling and before eating, drinking, chewing gum, or using tobacco. Remove and wash contaminated clothing before reuse. Clothing exposed to this product or harmful plant oils should be washed separately from other laundry with detergent and hot water. Refill this container according to the directions contained in the REFILL section of the label. If Empty: Place in trash or offer for recycling if available. If Partly Filled: Call your local solid waste agency for disposal instructions. Never place unused product down any indoor or outdoor drain. 4 years when stored in original container.